How old is your school desk? When it comes to antique furniture, school desks capture the imagination in a way few other pieces can. Emblematic of childhood and the iconic one-room schoolhouse, these old desks are affordable and fun to collect. Often featuring elaborate cast iron designs and beautiful craftsmanship, antique school desks bear little resemblance to the plastic and steel furniture currently featured in most modern schools. These old desks are lovely to look at and more useful than you might imagine. 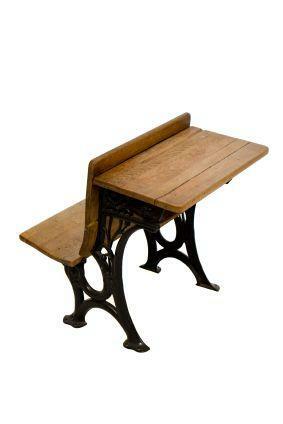 There are thousands of school desks in existence, many of them dating back to the late 1800s and early 1900s. They range in value from less than $50 to more than $3000. Factors affecting the value of the desk include age, condition, configuration, and scarcity. Since there are many options available at the lower end of the cost continuum, these pieces make an excellent entry item for beginning antique furniture collectors. Some desks featured a separate chair and desk surface. These were often constructed of wood and cast iron, and both pieces were usually bolted to the floor. Other school desks included an attached bench. The desk would extend from the back of the bench, providing a writing surface for the next row of students. Another common configuration is a chair with a side table attached. The student would rest his or her arm on the table to write. Some models featured a flip-up top. This could be used to store paper, pens, pencils, and other supplies. Others had a simple open shelf. You can use an antique school desk to decorate a child's room. Since they are sized to fit most children, they make an excellent place for a child to sit and study or color. They also provide a nostalgic feel, which is always nice in a child's room. Antique school desks also make great end tables or occasional tables. Because of their height and size, they offer a handy place to set a cup of coffee or a magazine. Many styles also have a shelf, which can be a perfect place to store TV remotes, books, and other necessities. You can also put a school desk to work as a telephone table. Even though most people now use cordless phones, you still need a handy place for the base unit. You can keep your phone book and message pad on the shelf and fill the inkwell with pens and pencils. If your antique school desk has a bench attached, it may make great mudroom furniture. You can place the desk so kids can access both the seat and the storage compartment. They can sit down to remove their boots and shoes and store mittens, hats, and school items under the desk surface. While it can be difficult to find a modern use for many pieces of antique furniture, school desks are the exception to the rule. These pieces were built for utility, and you can continue that tradition by putting them to work in your home.